The struggle to find a sense of purpose, and a sense of belonging can be such an insurmountable obstacle to overcome. Although it was not until his first year of High School when Ryan Dempsey, 20, discovered that sense of purpose, there was one thing nevertheless that was always clear to him: He loved to bring happiness to others through grandiose actions and statements. Eventually, it was the performance stage that proved to be the best platform to channel this desire. And together with guidance from the school's EPIC Theater Ensemble, an intense passion for acting emerged. Mr. Dempsey admits to never finding himself happier, nor more comfortable than when he is performing on stage, expressing himself , not only as a skilled actor, but as a musician, and stand-up comedian as well. At his Alma-mater, the Bronx High School For Writing and Communication, Ryan worked with EPIC and performed in the award-winning “Shakespeare Remix” initiative, a series of productions designed to modernize Shakespeare for contemporary audiences. This initiative gave birth to modern versions of “Macbeth” and “Othello”, in which Mr. Dempsey portrayed the title character and Cassio, respectively. Ryan was also selected for EPIC's Summer Institute three years in a row, during which time he helped write and star in modern interpretations of the works of Henrik Ibsen including “Pillars of Society”. As a student of Iona College, Ryan continued to pursue acting and starred as Ray Dooley in the dark Irish comedy “The Beauty Queen of Lenane”, by Martin McDonagh. An adaption of Fyodor Dostoyevsky’s “Crime and Punishment” followed soon after where the talented young actor portrayed Marmaladov. 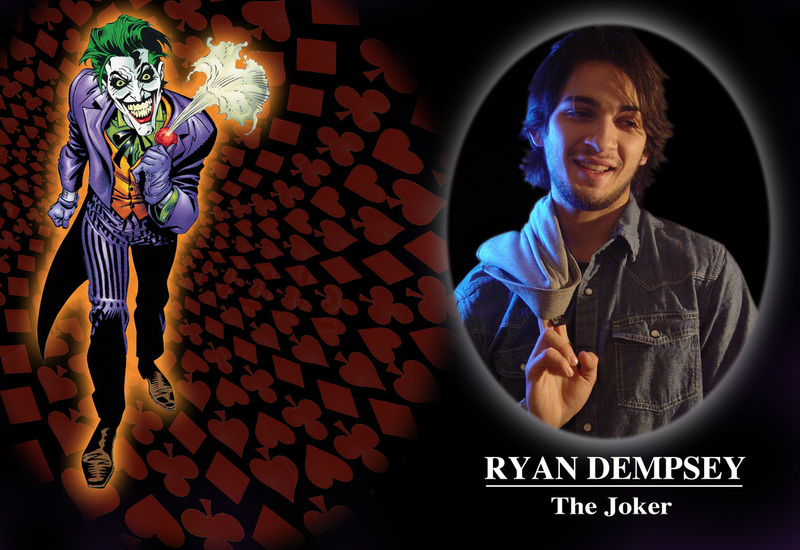 And now, with so many impressive performances of classic characters under his belt, Ryan Dempsey eagerly accepts the challenge of the role he has always dreamed of: Having been cast in playwright Roberto Williams' all-student stage production "FATHERS OF THE DARK KNIGHT", Ryan will now explore the depths of ultimate darkness and twisted insanity as he brings the iconic Clown Prince Of Crime THE JOKER to life on stage to confront The Batman and the other heroes of Gotham City! Mr. Dempsey would like to sincerely thank his close friends and family for supporting his pursuits, and his lucky lava lamp for helping to illuminate his path during his darkest days.